The Providence College Women’s Basketball Team had mixed results at this year’s Ocean State Tip-Off Tournament. The tournament consisted of all four Division I teams in Rhode Island, including the University of Rhode Island, Brown University, Bryant University, and PC. This year, the tournament was held on the URI campus at the Ryan Center from Dec. 1 to Dec. 2. PC’s women’s basketball team came into the Ocean State Tip-Off Tournament with a three game winning streak and a 3-2 record overall. The previous three wins came over Sacred Heart University, Boston College, and Yale University. PC’s first test in the tournament was a first-round game against URI, a team that also boasted a 3-2 record entering the matchup. The game tipped off at 12 p.m. on Saturday. PC came out of the gates somewhat slowly, shooting just 11/28 (39.3%) from the field in the first half. Despite its low field goal percentage, PC managed to hold its own in the first quarter, trailing 23-19 at its end. PC struggled much more in the second quarter, scoring just 11 points while URI scored 18. PC’s struggles could be contributed in part to turnovers, as the team racked up 13 of them in the first half. By the end of the first half, URI led PC 41-30, with Maddie Jolin ’19 and Jovana Nogic ’19 leading PC in scoring with eight points each. PC came back far stronger in the second half, outscoring URI 19-17 in the third quarter and 16-14 in the fourth quarter. 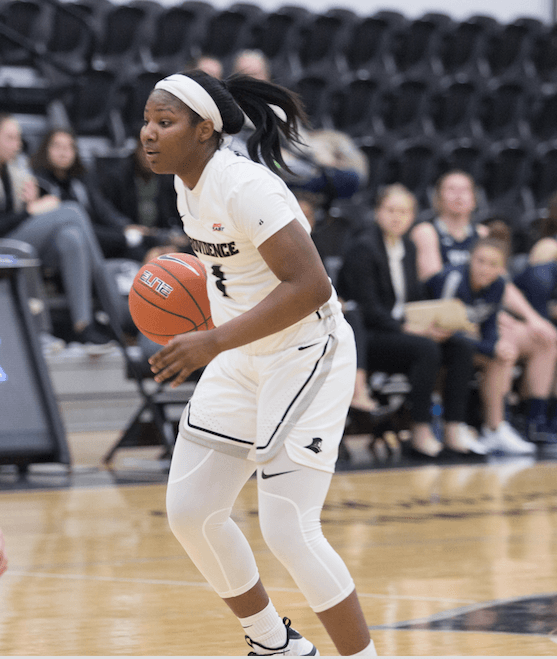 Unfortunately, the team’s strong second-half effort was not enough to overcome the first-half deficit; PC eventually fell to URI by a score of 65-72. PC’s record dropped to 3-3 on the season but there were some positive takeaways for the team. Nogic finished the game with 20 points, including six three-point field goals. Forward Mary Baskerville ’22 also notched a career-high point total of 11 points and retrieved eight rebounds. Jolin added 10 points and six rebounds for the team as well. After the loss, PC went on to play Bryant University in a consolation game on Sunday. Sunday’s game versus Bryant also tipped off at 12 p.m. at PC. Bryant entered Sunday’s matchup with a record of 2-5. This time, PC was more than ready to play and started the game strong. The team outscored Bryant 19-10 in the first quarter and Nogic continued to play strong, scoring 10 points in the first half alone. The team boasted a 53.8 field goal percentage, shooting 14/26 from the floor. At the half, PC led Bryant by a score of 33-31. Bryant continued to challenge PC in the second half as both teams scored 21 points in the third quarter. However, PC was ultimately able to distance itself in the fourth quarter, outscoring Bryant 18-12. PC won the game 72-64 and improved its record to 4-3 this season. The team has now won four of its last five games. Nogic continued her impressive performance in the second half, adding 12 more points for a game-high total of 22 points. Another player who helped power PC’s offensive attack was Andrea Cooper ’21, who tallied eight second-half points and finished with 14 total points. The team now looks to prepare for its next game, which is scheduled to take place Saturday, December 8 against University of Massachusetts, Lowell in Lowell, Massachusetts.